I am not a fan of Charlie Sheen. Even before he went off the rails several years ago I disliked him. Back before he was “winning” he was simply “that guy who replaced Michael J. Fox on Spin City” and I was not interested. So when Ben announced that I would not like the next movie on our shelf, I knew we had arrived at Hot Shots!. That said, Hot Shots! is actually very funny. Like, funny enough that I’m starting to think Sheen was too good for Two and a Half Men. Interestingly, his former Men co-star, John Cryer, is also in this movie. So it appears they are both too good for that sorry excuse for a television show. But I digress. This is about a comedy that I had initially written off but was pleasantly surprised by, not a comedy that America should have written off years ago. Hot Shots! is a spoof of Top Gun, which seems redundant because have you seen Top Gun recently? It’s pretty damn funny. Anyway, this movie is actually meant to be funny. It’s mostly silly and over the top, but succeeds thanks to an excellent cast who fully commits to every insane joke and gag. I can admit that Sheen is great in this movie. He’s perfect as the reckless Topper Harley, a pilot who is grounded due to psychological issues. The only time he is outshone is when Lloyd Bridges appears as his commanding officer. But really, who wouldn’t be out-funnied by a veteran actor like Bridges? 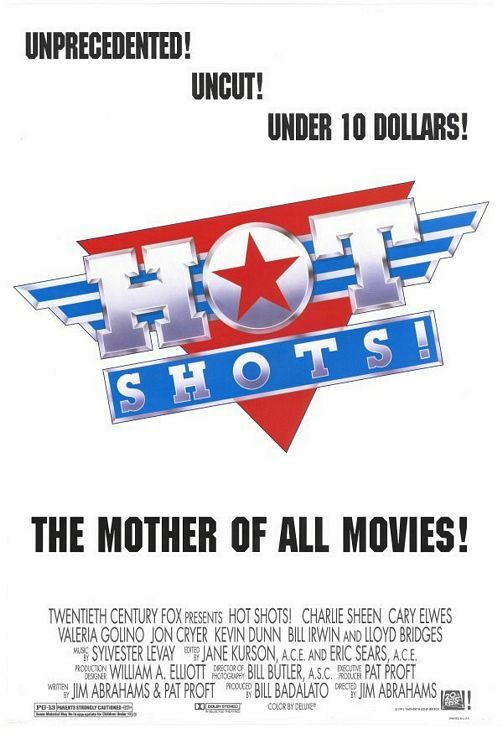 Of course, Hot Shots! doesn’t come close to the spoof films that preceded it. This is no Airplane! or Monty Python and the Holy Grail or Blazing Saddles. But compared to what passes for a spoof movie these days this is downright amazing (A prime example being the terrible Scary Movie franchise, which also stars Charlie Sheen in parts 3, 4, and 5.). Long before he was charming ladies man Charlie Harper in the overrated Two and a Half Men, Charlie Sheen was actually funny once upon a time. Hot Shots is a spoof of Top Gun, and is actually pretty funny. Sheen plays Topper Harley, a reckless pilot who has been kicked out of the Air Force for screwing up too many times. He is asked back to the ranks due to an undisclosed reason and they let him fly planes again. He agrees and is immediately met with a rival in the form of Kent Gregory (Cary Elwes), also a pilot, who doesn’t like Topper’s reckless ways and thinks he is a danger to the team. Topper also begins hitting on his ex (Valeria Golino) so that probably doesn’t help their relationship either. As with most spoof films, there is little plot to speak of here. It is basically just an excuse to get Charlie Sheen flying planes again and causing outrage among his superiors. The film is quite funny, most of the laughs coming from Sheen and the dim-witted Admiral Benson (Lloyd Bridges). The film is funny. It is nowhere near as funny as some other spoof movies such as Airplane! or anything Mel Brooks has done, but Hot Shots does have its moments. The sequel is actually pretty funny too because it spoofs all action films. There is really only one air force movie, which is Top Gun, and it can only be mined for so long before it gets boring. The sequel pokes fun at all action films, so there is a lot more for them to play with. Unfortunately, I don’t own the sequel to Hot Shots, so this review is the best you are going to get. Hot Shots is an amusing comedy that never reaches the highs of some classics, like Airplane (Flying High for you Aussies), but is enjoyable enough to sit through.